Don't get me wrong -- my girlfriend's amazing. But the way things have been going lately, I'm starting to believe that the only thing worse than not getting what you want, is getting it. Not only was I really please that we get a sequel to What My Mother Doesn't Know but I was really pleased it was going to be told from Robin's point of view. The story starts of at the exact place What My Mother Doesn't Know finished and follows the aftermath of Sophie's decision. I really enjoyed seeing this from Robin's point of view as well as getting to see Sophie through his eyes. I loved Robin in What My Mother Doesn't Know but I adored him in this. I loved how he is with Sophie and even though he makes a few mistakes it obvious that he's just a really sweet guy. Another aspect that plays a big part in this one is art. I loved the way Sophie and Robin communicated through it - the whole story board make up was great! I also liked how the two of them coped with the backlash over their relationship. Having read the previous book I had a really good idea of how much it was hurting Sophie and I was really, really annoyed at her friends for behaving the way they did. I'm not sure if I would be particularly forgiving! But I loved the whole T-Shirt thing. Very clever! 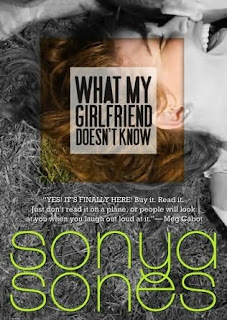 Again Sonya Sones infuses this story with great humour. Her books are just great fun to read and this time even the way the poems are presented on the page have meaning too. A couple of times these are hilarious! You'll understand what I mean when you read it. I think this one will have to share the top spot with One of Those Hideous Books Where The Mother Dies as my favorites of Sones books. I loved it! Oh, I love this one too! So brilliant to read your review. Thank you!